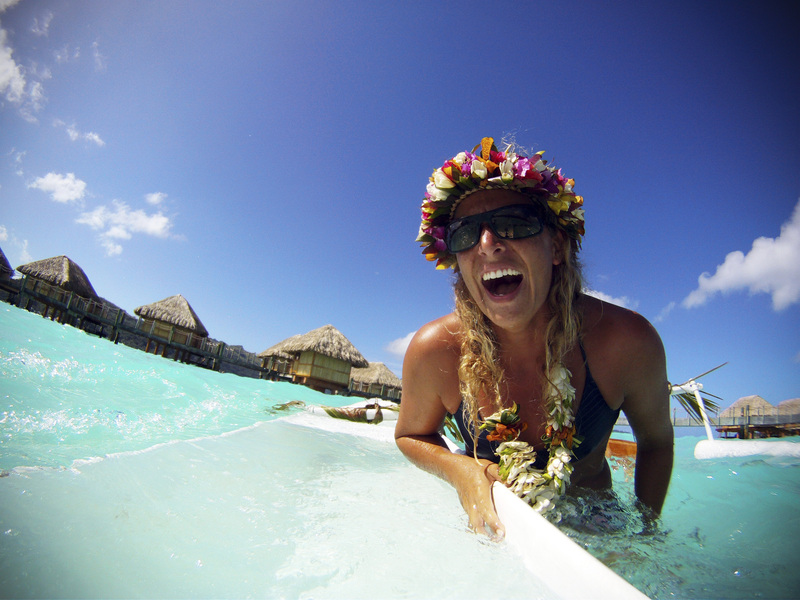 It’s funny how things work out…About a month ago, Gillian Gibree and I were trying to take each other out at the Battle of the Paddle, and then this weekend we were paddling together in a Honeymoon Outrigger in Bora Bora. Gillian owns a company in San Diego called Paddle into Fitness where she takes clients out daily to do standup paddleboard yoga and various other water based fitness activities. In the fall she will be holding a standup paddle yoga retreat at the Pearl Beach Resort and Spa in Bora Bora, so this weekend she decided to head out to Tahiti to scout out the location, and I followed along as a photographer/journalist. In addition to checking out the accomodations (I can now tell you from experience that those overwater bungalows are every bit as amazing in person as they are in the magazines), we both had the opportunity to train with Stephane Lambert, owner of Kainalu XT, a liquid based training program in Bora Bora. Stephane took us through three days of intense training, including swimming, rock running, standup paddling, 4 man outrigger, traditional paddleboarding, and the list goes on. There is so much to talk about from this trip to Tahiti, it is probably best left for a better time, one when I haven’t just been on a red eye for 9 hours. For now, however, I will leave you with some photos of our last morning at Pearl Beach. The beach boys allowed us to take the 2 man Honeymoon Outrigger out for a spin, which in retrospect may not have been the smartest idea on their part…Who knew it was so easy to sink one of those things? Oh Geez, we are going down!